Which Jet Tec cartridge do you need? 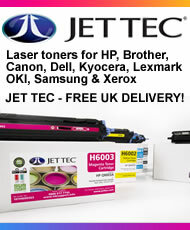 Browse our list of inkjet printers or laser printers and click on your printer model to see which cartridges you need and find out if Jet Tec is available for your printer. 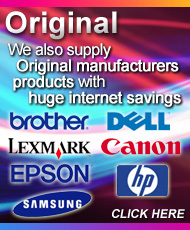 Jet Tec is Europes leading manufacturer of compatible and recycled printer products. Jet Tec has been established for over 25 years at its UK manufacturing base and is renowned for the quality, reliability and patented technology of their products. At UK Ink Supplies we only stock products that we believe represent the best value and quality on the market, we have nearly a decade of experience selling Jet Tec products throughout Europe and firmly believe that switching to Jet Tec will change the way you think about printing. 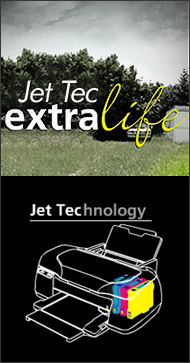 Jet Tec adhere to the highest environmental processes in the production and design of their cartridges. Many of todays manufacturers of printer cartridges are based in China, with the long distance transportation involved there are huge volumes of greenhouse gases emitted. Jet Tec products are manufactured in Lincolnshire, UK and therefore travel a shorter distance. Combine this with the UK Ink Supplies commitment of using land and sea based transport to transfer our goods between our distribution centres and you can be certain that carbon emissions are kept to an absolute minimum. You want to save money and you still want that photo of your granddaughters first birthday or your sons graduation to look as dazzling as the moment they were taken when you share them with friends and family. Jet Tec cartridges match the original manufacturers guidelines for light-fastness ensuring that your precious moments stay as true as your memories for a lifetime. We know you will be extremely pleased by the results offered by Jet Tec, but in case you have any more questions you can always contact a member of our highly trained customer service team who will answer any additional questions you may have. You can find our contact details here.